Here How You Can Hold All Wooden Parts Together Like A Pro Craftsman & Save Your Time & Effort! Looking for a wood clamp tool for your next woodworking or cabinetry project? Need a metal face clamp that will make your life easier? Want to hold together any kind of material with zero effort? Introducing The Ultimate Woodworking 3-Inch Face Clamps 2-Pack By Valiant! Now you can have not just one, but two heavy-duty metal frame clamps for an amazing price! Our woodwork grip clamps are designed to offer you unparalleled versatility and performance, thanks to their sturdy construction and ergonomic design! Why Choose The Valiant Quick Grip Clamps? Perfect For Both Beginners & Experienced Craftsmen - our userfriendly clamping tools can be easily used by both woodworking rookies and seasoned veteran carpenters, thanks to their practical one-handed design and robust materials! Ideal For Securely Holding Together All Parts - whether you want to build a cabinet, a bench, a chair, a metal cupboard or need to repair your deck, our 3" c-type metal clamps will make your life easier and ensure that your project is completed to perfection! Larger Flat Surface & Heavy-Duty Design - while other flimsy cabinetry clamps may break after a few uses, our premium face clamps are designed to endure any abuse while the larger round flat surface will maximize their stability and prevent scratches and marks! Just to offer you that much-needed peace of mind, we back our tools clamps with a 100% risk-free money back guarantee! Rest assured that your investment is risk-free and indulge yourself now! Click "Add To Cart" NOW & Get Your Own Metal Frame Clamps Before We Run Out Of Stock... Again! DISCOVER THE MUST-HAVE TOOLS FOR YOUR NEXT WOODWORKING PROJECT! The Valiant premium c-clamp tools are here to help you hold together almost all materials and make your cabinetry, woodworking, DIY repairs or building projects as hassle-free as possible! THE LARGER ROUND METAL SURFACE WILL HOLD THE MATERIALS SECURELY and distribute the binding force evenly, so you can rest assured that your corners will be picture perfect! Ideal for all materials up to 2/3-4-inch (70mm) thick, our ergonomic woodworking face clamps will not leave marks on your wooden surfaces! 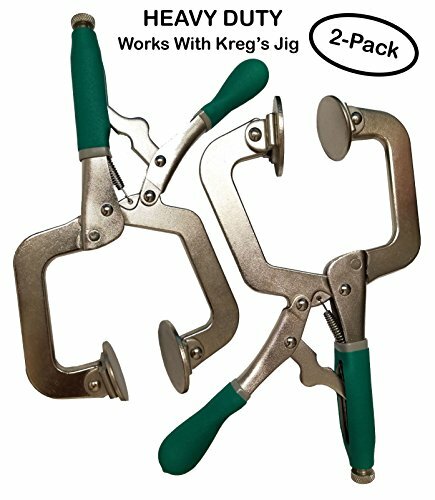 UNLIKE ALL THOSE CHEAPLY-MADE CLAMP TOOLS that fall apart after a few weeks, we have made sure that your woodworking clamps set can endure any abuse and pass the test of time. The robust construction will allow you to add a wood table clamps set to your toolbox for years to come! YOU WILL WONDER HOW YOU EVER GOT ALONG WITHOUT THEM! The Valiant grip-on metal clamps are compatible with the Kreg R3 Jr Pocket Hole Jig System, so you can effortlessly use them with your existing woodworking tools. Plus, the fuss-free onehanded design will allow you to secure your corners with zero effort! 100% CONVENIENCE OR YOUR MONEY BACK! That's our unconditional guarantee! If you are not 100% thrilled with your lightweight, sturdy and user-friendly c-type clamps 2pack by Valiant, we promise to offer you a prompt and full refund! No questions asked! What are you waiting for? If you have any questions about this product by Valiant, contact us by completing and submitting the form below. If you are looking for a specif part number, please include it with your message.